Food fight! America v Europe Jump to media player The US and European Union are struggling to agree on food safety standards - among the major issues in a huge new trade deal. Greece divided? Explained in 60 secs Jump to media player Can Greek Prime Minister Alexis Tsipras count on the support of his governing coalition? Iran negotiations in 90 seconds Jump to media player International negotiations on Iran's nuclear programme are due to finish, but it is thought they could continue into July. India vs China - in 60 seconds Jump to media player BBC News compares the Asian giants of India and China. China's smartphone giant: In 60 secs Jump to media player Xiaomi may well be the biggest smartphone maker you've never heard of. BBC News has made this guide to the Chinese tech giant. The staying power of African presidents Jump to media player After a third-term bid by Burundi's president triggers protests, BBC News takes a 60-second look at how long Africa's leader are staying in power - and the reaction. Mediterranean migration in numbers Jump to media player BBC News looks at the number of migrants trying to reach Europe. 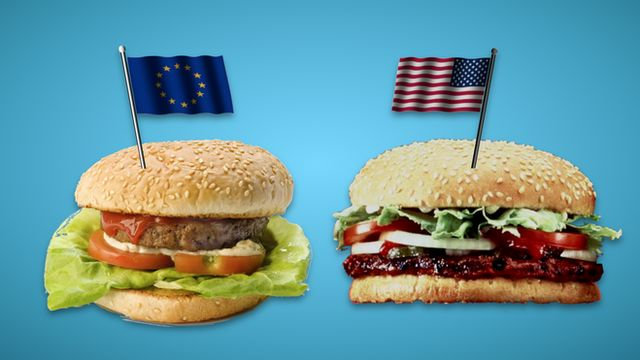 What will the proposed EU-US free trade deal mean for the food on your plate? The European Parliament will vote on priorities for the Transatlantic Trade and Investment Partnership (TTIP) on Wednesday. BBC News explains what's at stake for your steak.